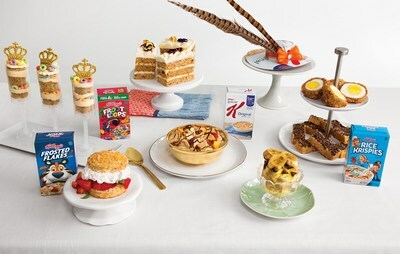 BATTLE CREEK, Mich., May 7, 2018 /PRNewswire/ -- As the royal nuptials take place early in the morning stateside, Kellogg's® invites all NYC-based royal fanatics to the ultimate breakfast and viewing party on May 19 at 5:30am E.T. – complete with edible glitter, cereal box fascinator hats and Tony the Tiger in dapper form! Cereal lovers across the U.S. also have a unique opportunity to join in the fun, as Kellogg's® offers DIY recipes and tutorials to throw a cereal-inspired watch party of your own. Kellogg's® is a proud royal warrant holder, meaning we've had the privilege to be the official cereal provider of the royal household for three monarchs. 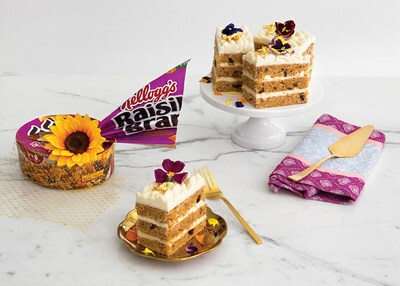 For the event, Kellogg's® has teamed up with former royal chef Darren McGrady to craft a celebratory, multicourse breakfast that elevates the watch party experience and helps cereal lovers reimagine the breakfast staple. U.K. grandeur will meet U.S. appeal to create a delicious, cereal-centric pairing menu worthy of the royal occasion. Kellogg's NYC Café will open its doors for early risers to watch the televised ceremony at 5:30 a.m. ET. Visitors can enjoy a one-of-a-kind viewing experience, feast on a modern cereal-centric breakfast and even create their own Kellogg's-inspired fascinator! Fashion designer Kelly Dempsey will host a live demo to show guests how to create a cereal box fascinator hat with a regal twist. For royal family enthusiasts who would rather sleep in, select menu items will be available for purchase following the early-morning affair. Join us at Kellogg's NYC Café for the wedding watch party of the season – reservations available on OpenTable.com or the OpenTable app beginning May 9. 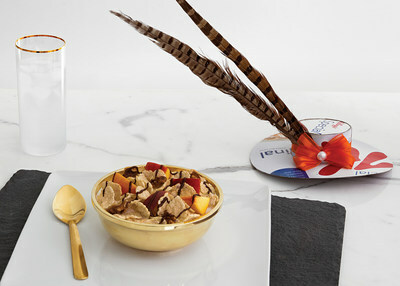 Or you can find everything you need to host your own celebration at kelloggsnyc.com! Wow your guests with any of our DIY recipes and how-to videos for each of our cereal-inspired fascinator creations. Don't forget to share highlights from your special event on social media using #KelloggsNYC! For more information on how Kellogg's is celebrating the upcoming royal nuptials and other exciting announcements, follow Kellogg's NYC on Instagram and Facebook. OpenTable, part of Booking Holdings, Inc., is the world's leading provider of online restaurant reservations, seating more than 25 million diners per month via online reservations across more than 45,000 restaurants. The OpenTable network connects restaurants and diners, helping diners discover and book the perfect table and helping restaurants deliver personalized hospitality to keep guests coming back. The OpenTable service enables diners to see which restaurants have available tables, select a restaurant based on verified diner reviews, menus, and other helpful information, and easily book a reservation. In addition to the company's website and mobile apps, OpenTable powers online reservations for nearly 600 partners, including many of the Internet's most popular global and local brands. Darren was chef to Queen Elizabeth II, Diana, Princess of Wales and Princes William and Harry for fifteen years and has cooked for five US Presidents. He is now owner of 'Eating Royally' fine dining, author, culinary consultant, event planner and public speaker living in Plano, Texas. Darren's cookbook 'Eating Royally; recipes and remembrances from a palace kitchen' is in sixth print. His second cookbook The Royal Chef at Home - Easy Seasonal Entertaining released November 1, 2017. Kelly Dempsey is a self-taught fashion designer following her innate eclectic need-to-create instincts. Shortly after landing runner-up on Season 14 of "Project Runway," Rack Addik was born. As the founder and creative force behind the brand, Kelly implements the importance of "marching to your own beat" and daily self-assurance; in turn pushing her unconventional theory of fashion to all new levels. After growing up and being ridiculed for her beloved thrift store finds, Kelly felt a deep desire to make her own clothing at a young age. Today, Rack Addik stands strong in celebrating everyone's own individual imagination. A product of a creative space, Kelly's knack for design has quickly made a name for herself throughout the industry.